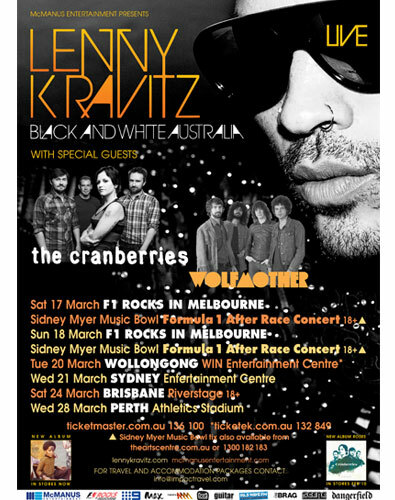 Australian news site Adelaid Now reveals today, in an article on Lenny Kravitz, that the American rock star will tour down under with The Cranberries next March. The Cranberries and Kravitz will also be joined by Australian rock band Wolfmother. Tickets will be on sale starting November 21 on Ticketmaster. Here’s a look at the tour poster. Thanks to Crancall from the cranberries.me community for the image.